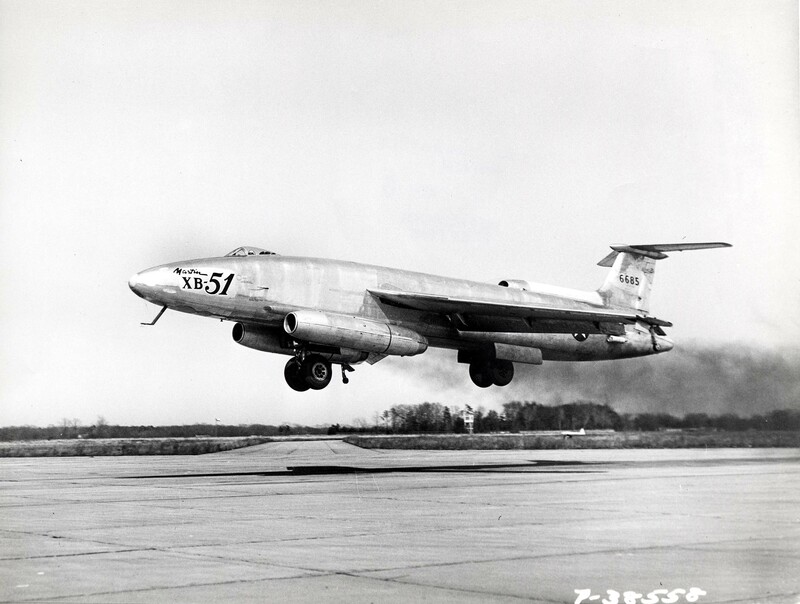 25 March 1956: At approximately 10:50 a.m., the first of two prototype Martin XB-51 three-engine attack bombers, serial number 46-685, crashed on takeoff from Runway 22 at El Paso International Airport (ELP). The pilot, Major James O. Rudolph, United States Air Force, survived the crash although he was seriously burned. Staff Sergeant Wilbur R. Savage, 28, engineer, was killed. Major Rudolph died of injuries 16 April 1956. Pieces of wreckage were marked “Gilbert XF-120” which had been painted on the airplane for the filming of the William Holden, Lloyd Nolan movie, “Toward The Unknown.” (Toluca Productions, 1956). The second prototype, 46-686, had previously crashed at Edwards AFB. A sleek jet bomber, carrying a full load of fuel, crashed while attempting a take-off at International Airport Sunday morning, killing the flight engineer and seriously injuring the pilot. The XB-51, the only one of its type in existence, smashed through the fence at the end of the southwest runway and then began to disintegrate, spreading wreckage along a 250-yard trail. Only the tail section of the three-engine bomber was left intact. Name of the dead man, a 28-year-old staff sergeant was withheld pending notification of next of kin. Flying the aircraft was Maj. James O. Rudolph, 36, one of the top test pilots in the Air Force. He suffered severe burns and was taken Sunday afternoon in an emergency flight to Brooke Army Hospital in San Antonio. Identification of the aircraft was confused for a short time after the crash. A piece of wreckage with the notation “Gilbert XF-120” was found nearby. Air Force spokesmen explained that the XF designation had been painted on the plane for use in the movie. The airplane had been refueled at International Airport and started its takeoff at 10:30 a.m. Witnesses said the plane got about three feet above the ground and suddenly settled. The tail dragged first and then the rest of the airplane settled, running at high speed. It ripped through a barbed wire fence at the end of the runway, raced across Airport Road and then began to go to pieces. After crashing, it burned and several explosions threatened firemen, rescuers and spectators who crowded around the flaming aircraft. First person to the scene of the crash was Eddie C. Wilkerson, 1106 Del Monte Drive, tennis coach at Austin High School. “I was just turning into the road to the airport when the plane was taking off. I don’t believe it ever got airborne. Wilkerson said that when he arrived, the major was lying on the ground about 15 feet from the burning wreckage. Other witnesses to the crash arrived and helped Wilkerson move the major to a safer place, away from the intense heat of the flaming aircraft. Capt. John D. Chandler, a doctor at the Biggs Hospital, was at the airport when the crash occurred and he was one of the first persons at the scene. He administered aid to the injured man until an ambulance arrived. Later Capt. Chandler flew to San Antonio with Maj. Rudolph. A fire truck from International Airport was rushed to the scene almost as soon as the plane stopped its forward motion. Sunday drivers were attracted to the scene by the tower of smoke and the heavy traffic delayed the arrival of fire trucks from Biggs Air Force Base. 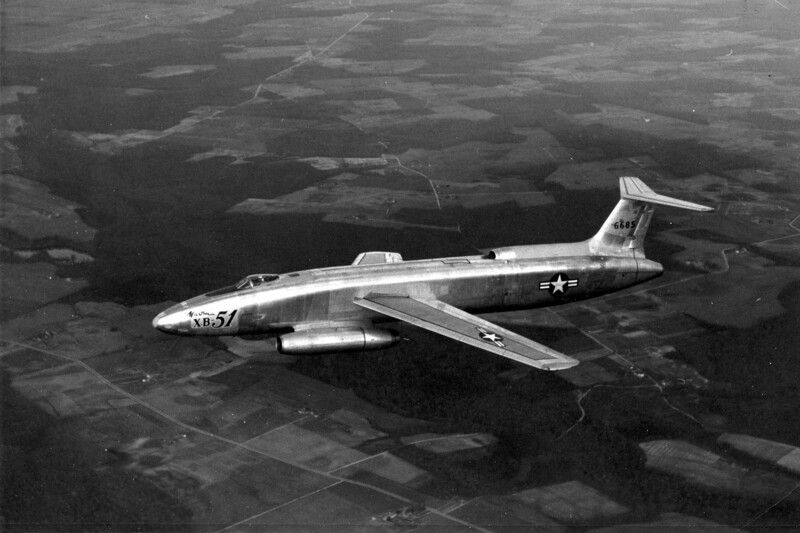 The plane was one of two XB-51s built by Martin Aircraft Co. and was completed in 1953. The first one crashed at Muroc, Calif., in 1952. Air Force spokesmen said the aircraft was comparable to the B-47, which was accepted instead of the XB-51 for use in the Air Force. Its three jet engines one in each wing and on in the fuselage, were capable of driving the craft at tremendous speeds. The aircraft had broken the sound barrier, spokesmen said. Its sleek lines gave it the appearance of a fighter rather than a medium bomber. Normally, the airplane carried a crew of three. Recently it had been used in assisting the Army in missile and anti-aircraft development at Aberdeen Proving Ground, Md. A board of officers was investigation the crash and two Air Force colonels arrived at Biggs Air Force Base from Muroc Sunday afternoon. Military police from Ft. Bliss and Air Police patrolled the area about the crash Sunday afternoon, keeping away the curious. James Otto Rudolph was born at Marion, Ohio, 8 February 1920, the first of two children of of Frank Otto Rudolph, a German immigrant who was employed as a secretary for the YMCA, and Helen Claire Shafer Rudolph. Following two years of college, Rudolph enlisted as an Aviation Cadet, U.S. Army Air Corps, at Detroit, Michigan, 17 March 1941. He was 6 feet, 1inch (1.854 meters) tall and weighed 175 pounds (79.4 kilograms). He was commissioned as a Second Lieutenant, Air Reserve, 31 October 1941,and was promoted to First Lieutenant, Army of the United States (Air Corps), 5 August 1942. He was again promoted, to Captain, 15 June 1943. Following the end of World War II, Rudolph was promoted to the rank of Major, 19 September 1946. He remained in the Air Force, but with military needs shrinking, he reverted to the rank of First Lieutenant, with date of rank, 7 December 1944. 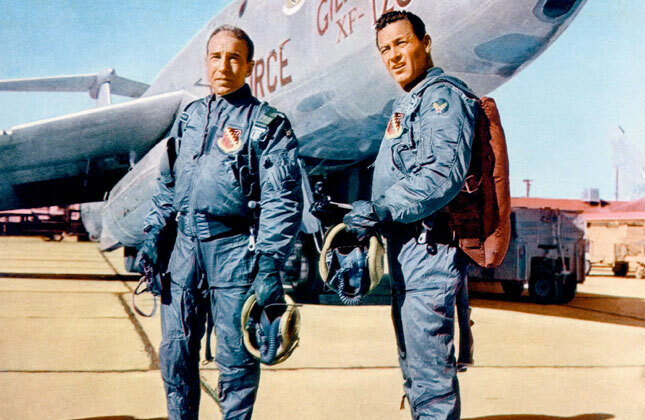 Major Rudolph graduated from the U.S. Air Force Experimental Flight Test Pilot School, Class 54-A, 2 July 1954. As a test pilot at Edwards Air Force Base, Rudolph was a project pilot in the FICON program in which Republic RF-84K Thunderflash reconnaissance planes were carried by modified Convair RB-36D bombers. During his military career, Major Rudolph had been awarded the Air Medal with three oak leaf clusters (four awards). After the crash on 25 March 1956, Major Rudolph was taken to Brooke Army Hospital, Fort Sam Houston, Texas, suffering from 2nd and 3rd degree burns over 38% of his body. He contracted septicemia and died there, 16 April 1956. He is buried at Arlington National Cemetery. The XB-51 was operated by a pilot in a single-place cockpit with a bubble canopy, and a navigator station inside the fuselage, below and behind the pilot. The prototype was 85 feet, 1 inch (25.933 meters) long with a wingspan of 53 feet, 1 inch (16.180 meters) and overall height of 17 feet, 4 inches (5.283 meters). The total wing area was 548.0 square feet (50.9 square meters). The airplane had an empty weight of 30,906 pounds (14,019 kilograms) and a maximum overload takeoff weight of 62,452 pounds (28,328 kilograms). The wings of the XB-51 were swept aft to 35° and had 6° anhedral. The wings’ angle of incidence (the relation of the chord to the fuselage longitudinal axis) could be adjusted to increase lift for takeoff and landing. They had 2° negative twist and were equipped with leading edge slats for improved low speed performance. Instead of ailerons, the XB-51 used spoilers. Power was supplied by three General Electric J47-GE-13 turbojet engines, with two located in nacelles outboard of the forward fuselage on 45° pylons, and a third installed in the tail with its intake on top of the fuselage. The J47-GE-13 was an axial-flow turbojet with a 12-stage compressor and single stage turbine. It had a normal power rating of 4,320 pounds of thrust (19.216 kilonewtons) at 7,370 r.p.m. ; military power, 5,200 pounds (23.131 kilonewtons) at 7,950 r.p.m. (30-minute limit); and maximum power rating of 6,000 pounds(26.689 kilonewtons) at 7,950 r.p.m., with water/alcohol injection (5-minute limit). The engine was 12 feet, 0.0 inches (3.658 meters) long, 3 feet, 3.0 inches (0.991 meters) in diameter and weighed 2,525 pounds (1,145 kilograms). A Rocket Assisted Takeoff (RATO) system was also installed. 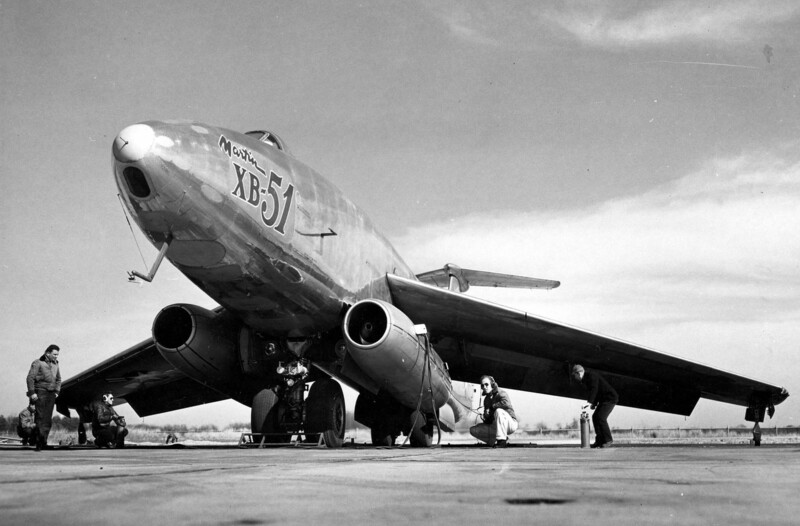 The XB-51 had a maximum speed of 560 knots (644 miles per hour/1,037 kilometers per hour) at Sea Level—0.85 Mach. The service ceiling was 39,400 feet (12,009 meters) and the maximum ferry range was 1,255 nautical miles (1,444 statute miles/2,324 kilometers). Armament was planned for a maximum bomb load of 10,400 pounds (4,717 kilograms) carried internally in a rotary bomb bay, and eight M39 20 mm revolving autocannon mounted in the nose with 160 rounds of ammunition per gun. 5-inch High Velocity Aerial Rockets (HVAR) could be carried under the wings or in the bomb bay.